A few weeks ago, I came across this picture, and I really liked the idea of a thin, hot pink picture frame. I have a lot of teal and orange in our living room, and hot pink seemed like it would be complementary. I decided to conduct my experiment on this frame, which I bought at an auction last fall for next to nothing. Those gold foil decals are stuck on the frame with little pins, and I removed them before painting. And I used hot pink craft acrylic paint to paint the thing. I pinned the foil decals back in, and I love the way they look against the pink. 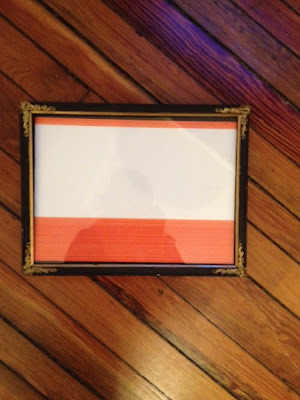 Much more modern than the black frame. 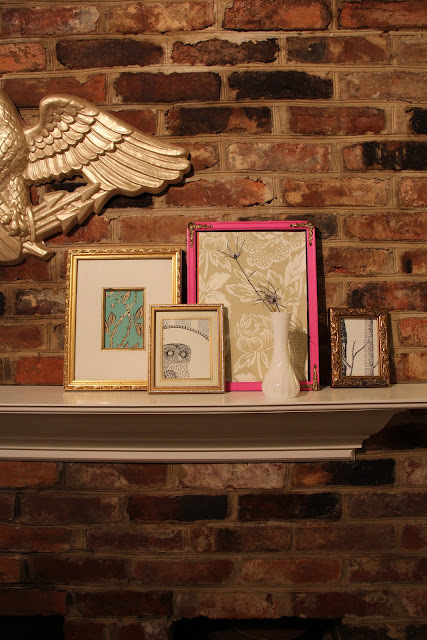 I have the pink frame on the mantel with some other gold frames I've had around the house. The images in the frames, by the way, are wallpaper samples that I've come across. Maybe someday I'll find real art to fill the frames, but for now, at least I've got some pretty placeholders.